Depp's sage (and apparently humorless) Tonto penetrates the iconic Western landscape like a punchline, delivering an accented line: "There come a time, kemosabe, when good man must wear mask." I'm sure his is a culturally-sensitive and realistic portrayal of Native American heroism. This should make for some very interesting Independence Day '13 viewing. Meanwhile, let's see some more Hammer, Disney! Otherwise it's The Tonto Show, which, who am I kidding, I'd watch anyway. 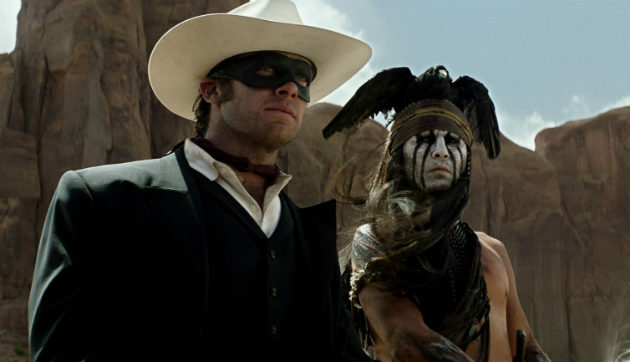 The Lone Ranger hits theaters July 3, 2013. Congrats on the new layout. Thanks for noticing, guys! We're obviously still working out a few kinks but your feedback (and your patience) is MUCH APPRECIATED. Indeed. The new layout looks cool. On this trailer, I thought the same thing. For a film called "The Lone Ranger" they sure treated the actual Lone Ranger as an after thought. No heroic shots of the Lone Ranger doing anything cool. Beyond that, the trailer looked quite fun. On a different and more controversial note, I do find it strange that that everyone seems to be giving a pass to the idea of a non Native American playing Tonto in 2012 simply because the person playing it is Johnny Depp. Johnny Depp is definitely a great actor, but it still feels strange that no one seems to find this wrong. Imagine if Johnny Depp was playing Shaft in a new Shaft. People would definitely be pissed. I mean, what's the difference? On your front page, you can no longer see how many comments there are on a given article. I miss that. Maybe you meant to do it, or maybe not, but I like being able to see which articles are getting a lot of comments. Just a little feedback. The look is very cool, though. I have recently started a web site, the info you provide on this website has helped me greatly. Thank you for all of your time & work. “Americans detest all lies except lies spoken in public or printed lies.” by Edgar Watson Howe.